“Invitation to … Villas in beautiful places” started out over 30 years ago as “Invitation to Tuscany” when my family moved from Leeds to live in the Tuscan countryside, fell in love with the place and wanted to share its beauty, culture and landscape with others. Over 30 years later, and around 200 Tuscan villas on our books, each one hand selected by us, we are venturing into other beautiful locations in Europe to find the best, most atmospheric villas for you to rent. We now have houses in Provence, the Italian Lakes and Umbria and will soon be adding villas on the stunning Amalfi Coast and glorious Northern Italy. For us, this is personal. Every area is chosen because of its beauty, every villa is selected and inspected by us. It might be boutique, it could well be quirky, it is probably historic – but it is certainly uniquely us. Because we will have been there, fallen in love with the place, stayed in the villa, met the owner and tasted the local wines. Our aim is to match you to the right villa. We’d love to talk to you and get an idea of exactly what’s important for you and your family, so we can advise you. We have built up a reputation over many years for personal, reliable service and will always give you the best advice we can. When you’ve booked we can also help you hire a car, book a chef, a cooking course or a wine tasting tour – all you have to do is ask. 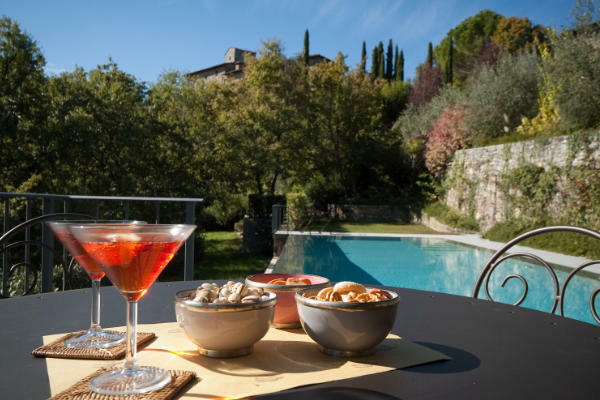 We have great places for families, with some particularly beautiful villas for family reunions, like “Dimora” in Chianti, “Archimede” on Lake Como or “Maison Romaine” in the Var region of Provence. Ref. 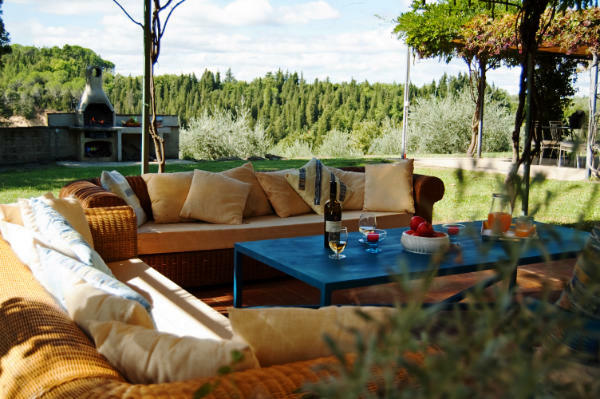 274 Dimora is a large, sprawling ground-level house, in the middle of a Chianti wine estate. Terracotta bricks and chestnut ceiling beams mix well with stylish colors and attractive fabrics of modern Italy and from every window there is the classic panorama of an ancient countryside. Every bedroom opens on to the garden, making it a house to be lived just as much outside as in, with a large brick barbecue and vine and wisteria covered pergolas wrapped around the building. It sleeps 12 and starts at £2,566 a week. Ref. 612 Archimede, on Lake Como, is a stunning modernist building in its own grounds with a pool, a Jacuzzi and, via a path through the woods, private access to the lake. Positioned to savour the lake and the wooded mountains surrounding it, clean lines, walls of glass and open lawns offer an extended family or a group of guests the feeling of retreat. If 'less is more', in this case it is also marvellous. The master bedroom has a terrace high above the lake with views that make you feel all’s well with the world. It sleeps 11 and prices start at £7,545 per week. Ref. 713 Maison Romaine is close to Cotignac, in the Var. Like an ancient Roman Villa it is wrapped around a central courtyard, which here shelters the swimming pool, surrounded by the rhythm of a covered arcade, thus creating a secluded and unique ambiance. Many of the rooms open directly on to this area, which creates a wonderful social environment and makes this an eminently liveable house. The interior is eclectic and comfortable and sleeps 12 and starts at £2,893 per week. 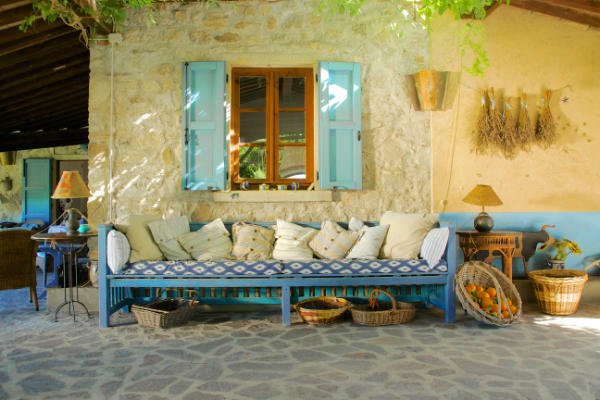 We choose houses that will provide you with your very own home away from home, allowing you to immerse yourself in the area and the local culture – shop in the local markets, visit vineyards, explore local walks, museums, hill top villages and art galleries. Get in touch to let us help you find the ideal base for a fantastic holiday. We are pleased to offer members a free case of wine with every booking! Please quote “Lifestyle” when making a booking or enquiry.